The cacti flower for just one month, and this is the cue for the American cactus bee to breed. 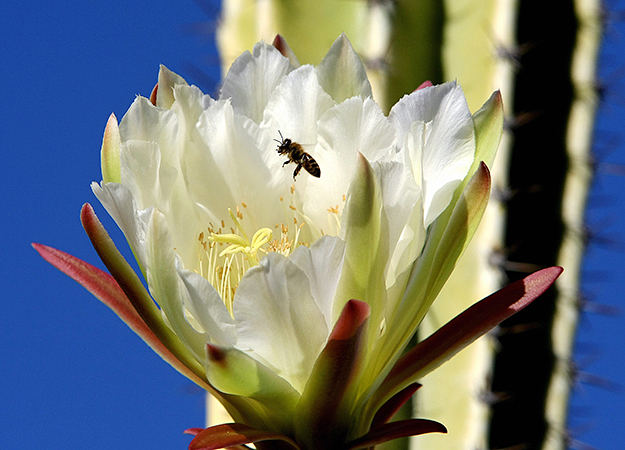 Thousands of bees gather at sites close to the cactus flower, where up to fifty male bees fight over access to one female, forming angry balls of mating bees. Once they have mated, the females dig nesting holes in the ground. Using their heads to jackhammer through the soil, they make a hole four to ten inches (10 to 25 cm) deep, in which they carve out ten to twelve cells. In each cell, they place a lump of pollen mixed with nectar, before laying an egg and sealing the cell. When finished, they will seal the whole nest. The job completed, the exhausted female bees will die. Just two weeks later, the young bees will hatch, the fastest journey time from egg to adult of any known bee.